The Texas House of Representatives (Spanish: Cámara de Representantes de Texas) is the lower house of the bicameral Texas Legislature. It consists of 150 members who are elected from single-member districts for two-year terms. As of the 2010 Census, each member represents about 167,637 people. There are no term limits, with the most senior member, Tom Craddick, having been elected in 1968. The House meets at the State Capitol in Austin. The Speaker of the House is the presiding officer and highest-ranking member of the House. The Speaker's duties include maintaining order within the House, recognizing members during debate, ruling on procedural matters, appointing members to the various committees and sending bills for committee review. The Speaker pro tempore is primarily a ceremonial position, but does, by long-standing tradition, preside over the House during its consideration of local and consent bills. Unlike other state legislatures, the House rules do not formally recognize majority or minority leaders. The unofficial leaders are the Republican Caucus Chairman and the Democratic House Leader, both of whom are elected by their respective caucuses. †Representative was first elected in a special election. Eligio (Kika) De La Garza, II, first Mexican-American to represent his region in the US House and the second Mexican-American from Texas to be elected to Congress (1965 - 1997). Suzanna Hupp, House of Representatives (1997–2007), survived the Luby's shooting, went on to champion individual gun ownership and carry rights. Mickey Leland, U.S. House of Representatives (1979–1989), died in a plane crash. Charles Henry Nimitz (1826–1911) Born in Bremen. In 1852, built the Nimitz Hotel in Fredericksburg, which now houses the National Museum of the Pacific War. Grandfather of United States Fleet Admiral Chester Nimitz. Elected to the Texas Legislature 1890. Rick Perry, longest serving Governor of Texas, (2000–2015) and current U.S. Secretary of Energy. Colonel Alfred P.C. Petsch (1925–1941) Lawyer, legislator, civic leader, and philanthropist. Veteran of both World War I and World War II. The Speaker of the House of Representatives has duties as a presiding officer as well as administrative duties. As a presiding officer, the Speaker must enforce, apply, and interpret the rules of the House, call House members to order, lay business in order before the House and receive propositions made by members, refer proposed legislation to a committee, preserve order and decorum, recognize people in the gallery, state and hold votes on questions, vote as a member of the House, decide on all questions to order, appoint the Speaker Pro Tempore and Temporary Chair, adjourn the House in the event of an emergency, postpone reconvening in the event of an emergency, and sign all bills, joint resolutions, and concurrent resolutions. The administrative duties of the Speaker include having control over the Hall of the House, appointing chair, vice-chair, and members to each standing committee, appointing all conference committees, and directing committees to make interim studies. The Chief Clerk is the head of the Chief Clerk's Office which maintains a record of all authors who sign legislation, maintains and distributes membership information to current house members, and forwards copies of legislation to house committee chairs. The Chief Clerk is the primary custodian of all legal documents within House. Additional duties include keeping a record of all progress on a document, attesting all warrants, writs, and subpoenas, receiving and filing all documents received by the house, and maintaining the electronic information and calendar for documents. When there is a considerable update of the electronic source website, the Chief Clerk is also responsible for noticing House members via email. On May 14, 2007, CBS Austin affiliate KEYE reported on multiple voting by representatives during House floor sessions. The report noted how representatives register votes for absent members on the House's automated voting machines. Each representative would vote for the nearest absent members (apparently regardless of party affiliation). This practice was in direct violation of a Rule of the House; however, no representative had ever been disciplined for the practice in the almost 70 years since the rule was adopted. Speaker Craddick, responsible for enforcement of House Rules, issued a statement that discipline for violations of the rule is left to the individual members. Chaos erupted in the Texas House of Representatives on Friday, May 25, 2007, when Rep. Fred Hill, R-Richardson, attempted to offer a motion to remove Tom Craddick as Speaker and have the House elect a new speaker. Craddick (also a Republican) refused to allow him to make the motion. The attempts to oust Craddick continued through the weekend as other Republicans made additional motions, which were also disallowed. The last time a Texas House speaker was removed by a vote of his fellow members was in 1871, when the House adopted a resolution removing Speaker Ira Evans. The Republican House majority removed Evans because he was seen as cooperating too much with Democrats on an elections bill. While Craddick's close allies say the 2007 attempt to remove Craddick was just an effort by Democrats to gain greater control of the legislature before the legislative and congressional redistricting process of 2011, Cook said that the fight was about Craddick consolidating power with lobbyists and using campaign contributions to maintain control of the House: "This is about the convergence of money and power and influence." In January 2009, Craddick lost the Speaker's chair after a challenge from Joe Straus. On June 20, 2013 Byron Cook served as chairman of the House State Affairs Committee hearing on Texas State House Bill 60. Cook's stance was for the passing of the bill and during the hearing he interrupted a testimony, saying "Some of us do (adopt children)." At 12:00 AM on June 21, Cook decided to close the hearing prematurely. Cook's explanation for breaching Texas State Legislature operating procedures was that the testimonies being heard had become repetitive. Twenty-four minutes later, Cook became personally offended by a testimony, ordering the cameras to be shut off and leaving the room of committee members and witnesses. Approximately 20 minutes afterwards, Cook was persuaded by colleagues to resume the hearing and continued listening to testimonies until he prematurely closed the hearing at 1:30 AM. Killer Ds a group of Texas House Democrats who left the state of Texas in 2003 to prevent House consideration of the redistricting legislation that benefited Texas Republicans. Texas Government Newsletter for long-time coverage of issues such as the Dirty Thirty, the Killer Bees, and Killer D's. ^ Elected as a Democrat in 2010, Lozano switched parties in March 2012. ^ Gonzalez, John W. (2015-04-21). 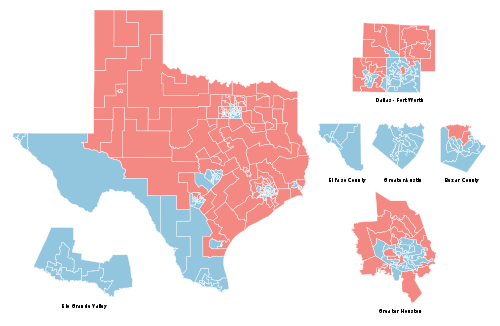 "Minjarez captures Texas House District 124 - San Antonio Express-News". Mysanantonio.com. Retrieved 2016-02-25. ^ Hispanic Americans in Congress, 1822-2012. U.S. Government Printing Office. 2013. p. 422. ISBN 016092068X. ^ a b "Texas House Rules" (PDF). Texas House of Representatives. Retrieved 1 March 2016. ^ "Service Providers". Guide to Texas Legislative Information. Archived from the original on February 15, 2015. Retrieved March 1, 2016. ^ The biennial appropriations bill is divided into eight Articles: General Government (I), Health and Human Services (II), Agencies of Education (III), The Judiciary (IV), Public Safety and Criminal Justice (V), Natural Resources (VI), Business and Economic Development (VII), and Regulatory (VIII). See http://gov.texas.gov/budget for an example of a budget showing the Articles. ^ CBS Channel 42 KeyeTV Investigates: One Lawmaker, Many Votes?, May 14, 2007, available at "https://www.youtube.com/watch?v=eG6X-xtVask"; see also Wilson, Nanci, One Lawmaker, Many Votes?, May 14, 2007, available at "www.keyetv.com/topstories/local_story_134224129.html"
^ a b c d R.G. Ratcliffe and Gary Scharrer. "The House struggles to move forward". Houston Chronicle, chron.com (May 27, 2007). Retrieved May 27, 2007. ^ "Anti-Abortion Bills Back on the Table". The Texas Tribune. Retrieved 2016-02-25. ^ "House panel quickly OKs 3 abortion bills". www.statesman.com. Retrieved 2016-02-25.